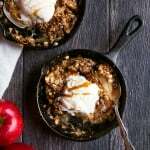 Although this is a mostly healthy, clean eating focused food blog, my naughty side loves all things sweet. AND I am a believer in the art of moderation in delicious sweet and treats, that’s why I started my monthly Indulge! series, which focuses on bringing you tempting, decadent recipes that are perfect for parties, impressing your significant other or just indulging in a cheat day at home. 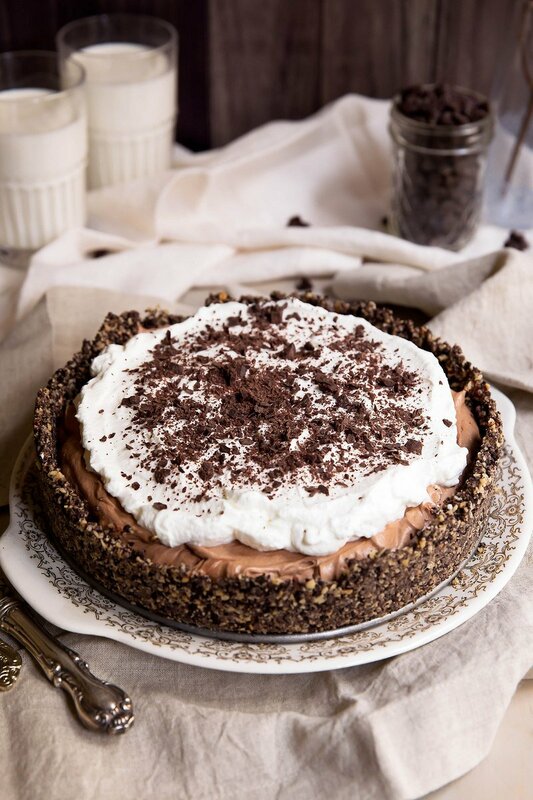 First, I must tell you the story behind this french silk pie because it’s one of my favorites! For the past two years, I’ve made Tony’s birthday dessert. The first year I made him a coconut cake with strawberry buttercream (AMAZING), but I really felt like I need to step it up a notch the year after that. So, I started asking him about his favorite desserts. We got chatting about how he loved blueberry and banana cream pie and all things chocolate. Then I asked him if he ever had French Silk Pie, and he proceeded to ask me what it was. Ummm… excuse me? Wait a minute… we’re dating and you haven’t had FRENCH SILK PIE?! Also known as the RICHEST and MOST DECADENT PIE on the planet! I was shocked. So of course, me being the birthday dessert wizard, began on a quest to make him the best french silk pie known to mankind. And so on his birthday last year, I made him this exact recipe decked out with candles on top and me singing happy birthday. After his first few bites of the pie I was concerned when he didn’t say anything. Did he like it? Did he hate it? What was happening? Did I totally just ruin his birthday?! Turns out he was in chocolate pie ecstasy, also known as a euphoric reaction to scarfing down a slice of this french silk pie. He couldn’t say anything because he was blown away. 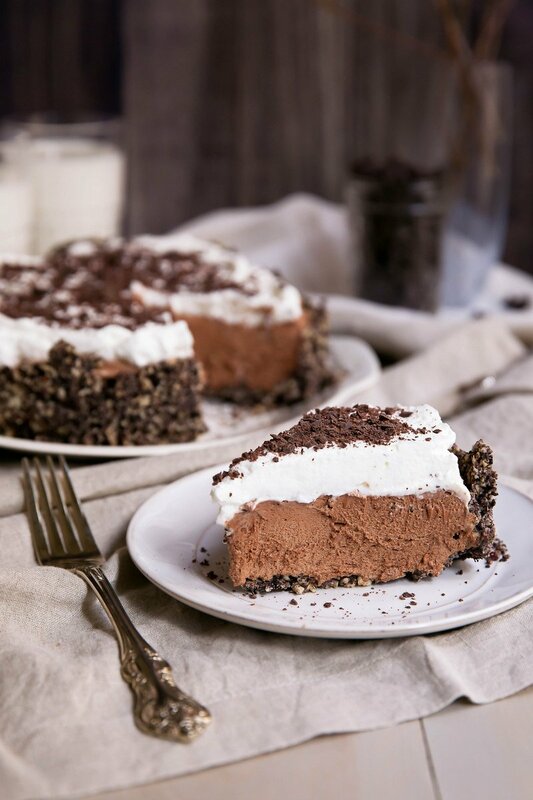 He told me flat out it was the best thing he’s ever had, and that it was his new favorite dessert; he only wanted my French Silk Pie from now on. And so here I am, finally bringing you this recipe that we now hold near and dear to our chocolate-loving hearts. I think it would make the perfect addition to your Thanksgiving table. Pumpkin pie is wonderful and all, but aren’t we due for something a little different this year? I mean, or you could just make two pies? Because that’s what I’m doing. However you enjoy this pie, just make sure you share it. It’s too addicting and rich to have around the house when you’re home alone. Trust me. BEST FRENCH SILK PIE EVER! 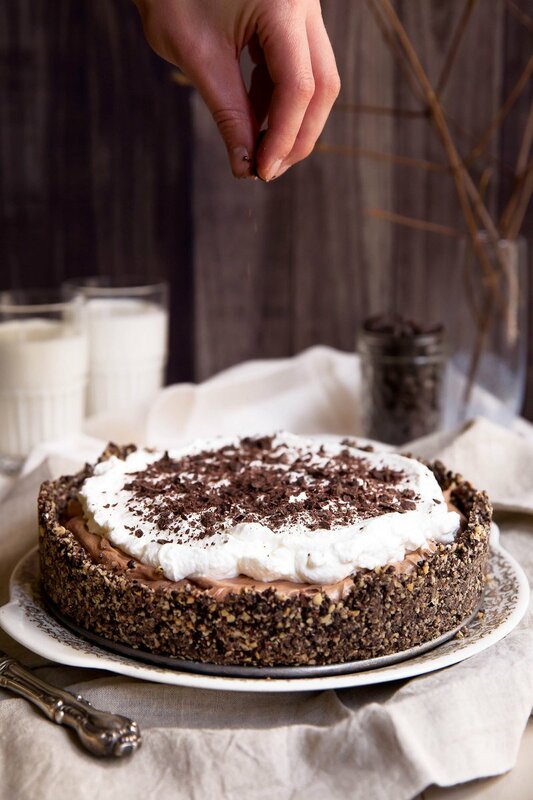 Incredible, rich and decadent French Silk Pie with a hazelnut oreo cookie crust. This deep dish version is sinful, impressive and a family favorite. Preheat oven to 350 degrees F. Grease a 9 inch springfoam pan with nonstick cooking spray or melted butter. Start by making the crust: Place cookies and hazelnuts in the bowl of a food processor and pulse for 1-2 minutes or until cookies are finely crushed. Add in melted butter and salt and process again until well combined. Dump the mixture into prepared pie pan and press into the bottom and side evenly. It should come up at least an inch to an inch and a half on the sides. Bake for 10 minutes then remove from oven and place on a wire rack to cool. To make the pie filling: Melt dark chocolate in a small saucepan over low heat, stirring occasionally. Once chocolate is completely melted, set aside to cool for 5-10 minutes. In a large bowl of an electric mixer fitted with a whisk attachment, beat together butter and sugar for 3 minutes or until sugar dissolves into the butter and is no longer grainy. You'll see the butter turn a light yellow/almost white color and become fluffy. This is good! Add in vanilla and beat again for 30 seconds. Next fold in melted chocolate and mix again so that the chocolate is well combined with the butter and sugar. IMPORTANT: Make sure that the chocolate has cooled to room temperature, or the chocolate will melt the butter and ruin the filling. Next add eggs, one at a time, beating for 4 minutes between each egg. You'll want to use the whisk attachment if using a KitchenAid mixer. (To be clear: Add an egg, beat for 4 minutes on medium speed; then add another egg, beat on medium speed for 4 minutes and repeat with final egg and final 4 minute mixing.) Pie filling should be thick and fluffy at this point. If it's a bit runny, don't worry, it should thicken up during refrigeration. Pour filling into cooled crust and cover with plastic wrap. Refrigerate for at least 8 hours, but preferably overnight. Once pie is ready to serve make the whipped cream topping: Add heavy whipped cream and 2 tablespoons of sugar to the bowl of an electric mixer; beat on high for 3-5 minutes or until cream reaches stiff peaks. Taste and add additional sugar if necessary and mix once more. Evenly spread whipped cream over pie filling, then garnish with dark chocolate shavings. Serves 9-12, depending on how large you cut the slices. Pie will stay fresh for a few days if properly covered and stored in the fridge. Notes: This pie uses raw eggs. You can use pasteurized eggs instead to prevent any food illnesses associated with consuming raw eggs. If you make this recipe, be sure to leave a comment below! You can also snap a photo and tag #ambitiouskitchen on Instagram. I love seeing your creations and featuring followers! You can also find me on Facebook, Twitter, Pinterest and Snapchat (username: ambitiouskitch). 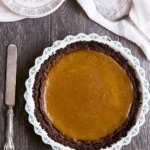 Best Ever Healthy Pumpkin Pie! 78 Responses to "Deep Dish French Silk Pie with Hazelnut Oreo Cookie Crust"
OMG this looks incredible. This is not only a keeper, but one saved for that very special occasion. Great recipe!! Everything in moderation especially over the holidays. 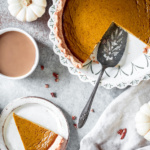 This looks like a perfect treat for Thanksgiving day and I love that it’s not pumpkin. Ahhh yes! The silk pie makes its debut! ahhh, the filling sounds amazing of course, but i’m preoccupied with the crust. i love hazelnuts (gianduja!! 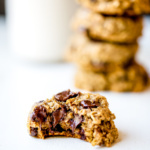 ), and it sounds like the perfect crunchy counterpoint to all that creamy chocolate. AH! 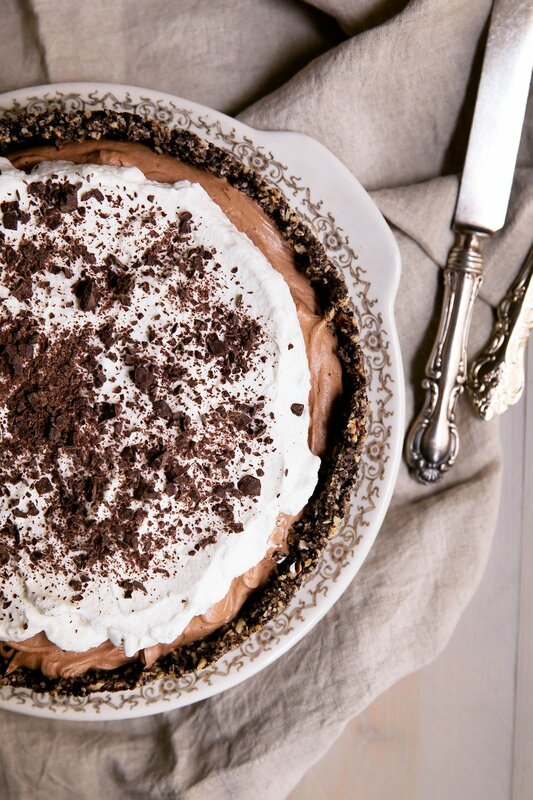 French Silk Pie is one of my FAVORITE pies too. I can’t believe Tony had never had it. I’m sure it was absolutely magnificent. I have yet to make my own french silk pie from scratch but I will certainly try this one when I get to it! I think the was in my dreams!!! This looks so decadent and delicious!!! I absolutely agree! For thanksgiving I totally want to mix it up when it comes to pies. I think it is good to do something different! Love this! Probably will make it on our designated pie table. Oh my goodness, yes, this pie sounds like the BEST EVER and I need it…and how had he never heard of French Silk Pie lol! Oh my gosh, this looks AMAZING! Absolute perfection. WHOA! this pie is everything!!! Hi Jena! I appreciate the feedback and if you make this pie, you are certainly welcome to use any chocolate cookies similar to Oreo. Personally, I think it’s okay to have an Oreo (or your cookie of choice) every once in a while. As you know, I love to bake and there are multiple recipes on here with Nutella and other non ‘super clean’ ingredients. Yes, I believe in eating clean, but I also believe in balance in one’s life, creativity in baking, and being happy. This pie made my boyfriend and happy. Sorry you may feel otherwise — but your comment was a little unnecessary. Hello Monique, Do you have to use a springform pan? Not at all! You could try a deep dish pie pan. Really any pie pan should be just fine. This looks amazing and I definitely want to make this for Thanksgiving! I was just wondering if there was any way to substitute the egg with avocado. No, I’m sorry! That wouldn’t work at all. This sounds and looks delicous! I’m going to attempt it for thanksgiving. did you use dark chocolate baking bars? I recommend using at least 60%. I like to use 80%! Hi Monique! 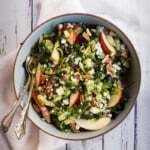 I love your recipes and am excited to try this one — I want to take it to our Thanksgving potluck at work. My question is regarding the whipped cream topping. Since I won’t be able to make the topping just prior to serving, is it ok to make and assemble the night before? Do you think it will hold ok? Thanks!! It has for me. Usually you are fine to make the whipped cream for about 12 or so hours ahead. Just make sure you keep the pie refrigerated! Just curious, when you say “dark chocolate” What exactly are you referring to? Just dark chocolate bars or something else? Can someone please clarify? You can use a 70 or 80% dark chocolate bar. Do you remove the frosting between the Oreos? Hi Monique, if I use pasteurized eggs, should this still be safe for a pregnant woman to consume? Thanks! Any chance this freezes well? Without the whipped cream of course. Oh gosh, I wouldn’t recommend it at all, but know that you can make it a day or two in advance (minus the whipped cream). I have made a similar chocolate dessert for years and I freeze it even decorated with whipped cream. I whip cream with powdered sugar. Let sit for a few minutes before serving. Works a treat. Also used toasted almonds, always added some Frangelico or Almond liquor to the crust. I have no idea where to get pasteurized eggs. I made this for Thanksgiving! It rocked. I only had semisweet chocolate so I cut the sugar in the whipped cream to ensure it wouldn’t be too sweet. I piped on the whipped cream. It was so pretty and tasty my mom thought I got it from a bakery. Thanks! Is there anything I can use instead of eggs? I’ve read other recipies, they say you can use sour cream. Do you think that’ll work or do you know something else? No I would not recommend sour cream or anything else for that matter, but you can use pasteurized eggs if you are concerned. I was asked to bring a French silk pie to Christmas at my brother’s house – it’s my niece’s favorite dessert. I made this recipe two days ahead of time, kept it cold and added the whipped cream just before serving. When I pulled it out of the refrigerator, nobody could believe it – it looks absolutely beautiful when you remove the sides of the springform. (I think everyone was expecting that I’d bring something from a bakery.) I followed the instructions exactly, which wasn’t difficult at all. The only mistake I made was that the dark chocolate bar was cold when I tried to “shave” it for the garnish – it mostly just crumbled, but that was really no big deal. Thanks for making me a hero with this recipe. Hi Monique – did you use salted or unsalted butter? Hi! I would like to start making this too in the next few hours. For the crust, I don’t really like oreos. 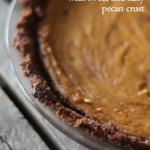 Do you think salted peanut and date crust could work? I know my friend is obsessed with peanut butter type dishes so I was wondering if incorporating peanuts could work for this! Or roasted almonds or something of the sort… or speculous. As for the topping, could a berry whipping cream be good or too much? or coconut cream? This is on my Thanksgiving menu this year. I can’t wait to try it! Thank you for this recipe and all your other wonderful recipes. This is an amazing recipe! I made the filling and it was so delicious, I’ve been attempting a French silk that is similar to bakers square, but none of the recipes I’ve made are nearly as rich. THIS IS IT. I made a gluten free coconut flour crust and it was perfection. No left overs when I made it for my family. Thank you, Monique- love your recipes! Is it possible to sub out butter? Unfortunately I don’t think so! Just made this for Thanksgiving dinner with my fiance’s family and everyone loved it!! Everyone was raving about how great it was. I used 85% chocolate and the sweetness of the pie was perfectly balanced. Thank you for this amazing recipe!! So happy to hear that!! It’s my absolute favorite for a reason 🙂 Hope you had a fabulous Thanksgiving! I made this for Thanksgiving – chocolate pie is a new staple now! Thank you! Directions made this can’t cook girl very successful! I made this for Thanksgiving this year, and it was a huge success! I saw this recipe last minute and didn’t have hazelnuts, so I made it without, and it was still delicious. Will try again with hazelnuts next time! I’ve been making this recipe for a couple years now for holidays. My family always asks for it and are convinced it comes from s bakery. Thank you!!!! Hi! I don’t have a stand mixer. Could I just use a handheld? At what point do you release the springform? Is it after cook g crust/while cooking? After the filling is in? Thanks for the help. Making this on Christmas for hubby’s birthday “cake”. You release it when you are ready to serve the pie with everything in it (including the whipped cream)! This pie was phenomenal. It would have been even better if I could read instructions properly. I accidentally added 3/4 cup butter to my crust, and had to bake it 3 times as long. FIgured it out while making the filling, but it still worked. Crust was a bit tough, but superb flavor throughout this pie 🙂 Husband very much enjoyed his birthday because of it! Whoops! Glad it still worked out 🙂 Our husbands have a fav birthday treat in common now!